Chief Justice of Nigeria Walter Onnoghen. The dust raised by the sudden charge and proposed arraignment of the Chief Justice of Nigeria (CJN), Walter Onnoghen, who is the highest judicial officer in the country, before the Code of Conduct Tribunal (CCT) is yet to settle. Nigerians are still debating the propriety and legality of the action. Chief Ferdinand Orbih (SAN) in this interview with Assistant Editor, Law and Foreign Affairs, JOSEPH ONYEKWERE maintains that the Chief Justice of Nigeria and other heads of court at the national and state levels enjoy immunity and special status under the country's constitution. The Code of Conduct Tribunal (CCT) is a lower court with constitutional recognition like the High Courts. Can a High Court make an order to stop proceedings at the CCT? Very recently the Federal High Court issued an interim order enjoining all parties including the CCT to maintain the status quo ante bellum pending the determination of the motion on notice seeking an order of injunction restraining the CCT from proceeding with the trial of the Chief Justice of Nigeria (CJN). In law, status quo ante bellum means the state of affairs between the parties, before the beginning of hostilities. In other words, nothing should be done by the parties to alter that state of affairs which includes the fact that Justice Walter Onnoghen is in office as the Chief Justice of Nigeria and exercising all the authority of that office, without let or hindrance from the executive arm of government that is seeking to remove him from office. Now to your question on whether the High Court can make an order to stop proceedings at the CCT. Let me start by saying that I don't usually make reference to specific sections of statutes or case law in interviews of this nature since such interviews are for the reading public including non lawyers. On this particular occasion, because of the times we are in and the nature of this interview, I shall deviate from the normal pattern by making reference to both case law and statute to buttress some of the points I shall be making. You are correct to say that both the High Courts and the CCT have constitutional recognition. That is where the similarity starts and ends. However, there are fundamental and significant differences between the status of the CCT and the High Courts under the Constitution of the Federal Republic of Nigeria 1999 (as Amended). For instance, while the High Courts at the Federal and State levels of government are superior Courts of Record, the CCT is an inferior tribunal, subject to the supervisory jurisdiction of the High Court. Any argument or postulation to the contrary cannot be sustained in view of the provisions of Section 6 (5) (a)-(i) of the Constitution, where the Superior Courts of record are expressly identified. The CCT is conspicuously missing from that section. If the framers of our Constitution had intended the CCT to be a superior court of record, they would have included it among the courts named in Section 6 (5) of the Constitution. Section 287 (1) of the Constitution, paragraph 15(1) of part 1 of the 5th Schedule to the Constitution and Section 20(1) of the Code of Conduct Bureau and Tribunal Act that created andempowered the CCT did not confer on it, the status of superior court of record. In any event, the Supreme Court settled the issue of the status of the CCT in the case of METUH V. FRN (2017) ALL FWLR PT. 901 wherein it stated as follow: "This court (the Supreme Court) pronounced also in Olubukola Saraki v. Federal Republic of Nigeria (2016) 3 NWLR (Pt. 1500) SC 531 that the Code of Conduct Tribunal (CCT) is not a court of superior record of jurisdiction, but a court of quasi-criminal jurisdiction." Since the CCT is not a superior court of record, the Federal High Court has the jurisdiction to stop proceedings at the CCT. 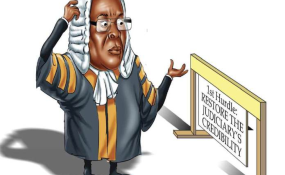 What must be borne in mind are the immortal words of the Court of Appeal per Wogu JCA in the case of National Electoral Commission (NEC) V. Nzeribe that; " a tribunal no matter how highly clothed with power is still a tribunal and so an inferior court and subject to the supervisory jurisdiction of a superior court of record, such as the High Court of Lagos State." There have been divergent opinions about the charges against the CJN for a number of reasons; one being that it is unprecedented in Nigeria. With this, will you advocate constitutionally recognized immunity for CJN's office? One of the major problems we have in Nigeria is not the absence of laws but the general unwillingness of those concerned to comply with or obey them. It is disturbing when those who (by virtue of the high office they occupy) swore to uphold the Constitution are the ones flouting its provisions. Now one of the definitions of immunity in the Oxford Dictionary is "an act exempting someone" e.g. "he was granted immunity from prosecution." In line with this definition, Section 308 of the Constitution readily comes to mind when discussing the officials granted immunity under our Constitution. The said section donates immunity to the President, Vice-President, Governors and Deputy-Governors from civil and criminal processes. However a cursory look at section 292 (1) (a) of the Constitution will reveal that the Chief Justice of Nigeria, President of the Court of Appeal, Chief Judge of the Federal High Court, Chief Judge of the High Court of the Federal Capital Territory and other heads of Federal Courts can only be removed by the president acting on an address supported by two-thirds majority of the Senate, praying that they be so removed for their inability to discharge the functions of their office or appointment (whether arising from the infirmity of mind or of body) or for misconduct or contravention of the Code of Conduct. Similarly, at the state level of governance, the Chief Judge of a State, the President of the Customary Court of Appeal of a State or the Grand Khadi of a Sharia Court of Appeal of a State can only be removed by the governor acting on an address supported by two-thirds majority of the House of Assembly of the State. All other Judicial officers are removable from office by the President or, as the case may be or the governor acting on the recommendation of the National Judicial Council that the judicial officer be so removed for his inability to discharge the function of his office or for misconduct or contravention of the Code of Conduct. You would recall that the provisions for the removal of the President, the Vice-President, Governor or Deputy-Governor from office are impari-material with those for the removal of the Chief Justice of Nigeria and other heads of Court. It is clear from the above, that the Chief Justice of Nigeria and indeed other heads of Court at the National and State levels of governance enjoy immunity and special status under the Constitution. This was done to shield them from the whims and caprices of the President and Governors lest we will be faced with a situation where the CJN and other heads of court would be removeable from office merely because they are not amenable to control by the executive branch of government or they are of a different tribe or religious persuasion from that of a president or governor. Furthermore, the framers of the Constitution knew that it would be incongruous to drag the CJN and other heads of court to trial on acts bordering on misconduct or contravention of the Code of Conduct without first removing them from office. To do otherwise would be to drag the institutions and the offices they occupy in the mud and diminish the status of the institutions in the process. When the person of the Chief Justice of Nigeria is dragged to the Code of Conduct Tribunal without first trying him and removing him from office as envisaged under the Constitution, you are putting the entire Nigerian Judiciary on trial. Those who are carrying out the present shenanigan of dragging the Chief Justice of Nigeria to the Code of Conduct Tribunal without compliance with due process of law need to have a rethink. This is not about rubbishing the honourable Justice Walter Onnoghen. It is about rubbishing, embarrassing, intimidating and scandalizing the entire Nigerian Judiciary, which he heads. Every citizen of Nigeria needs the judiciary. Without a reliable and efficient judiciary, the society will be at an end. What is your interpretation of paragraph 3 of the Fifth Schedule of the 1999 Constitution, which prohibits a Public Officer from operating an account outside the country? Does it prohibit the operation of an account in foreign currency in Nigeria? Paragraph 3 of part 1 of the 5th Schedule to the Constitution of the Federal Republic of Nigeria provides as follows: "The President, Vice-President, Governor, Deputy-Governor, Ministers of the Government of the Federation and Commissioners of the Governments of the States, members of the National Assembly and of the Houses of Assembly of the States, and such other public officers or persons as the National Assembly may by law prescribe shall not maintain or operate bank account in any country outside Nigeria" My first take on the provisions of Paragraph 3 of Part 1 of the Fifth Schedule set out above is that it does not apply to Judicial Officers. A close look at its provision will reveal that while there is a comprehensive mention of the leadership and members of the Executive and Legislative arms of government, no mention was made of the leadership and members of the judiciary at the National and State levels of governance. If we apply the canon of interpretation of statutes that what is not expressly provided is excluded by implication, it will become clear that it was not the intention of the framers of the Constitution that its provisions should be made applicable to the leadership and members of the judiciary. Secondly, the paragraph does not forbid the maintenance of foreign currency denominated account in a Nigerian bank operating in Nigeria by public officers to which it applies. In other words, a public officer to whom the paragraph applies cannot operate a bank account in a Nigeria bank operating outside the country. While a public officer to whom the paragraph applies may operate a foreign currency denominated account in Nigeria, such an officer cannot operate any account denominated in any currency outside Nigeria. Even though most lawyers want quick justice delivery, the speed with which the Petition was filed, charges drafted against the highest judicial officer in the country and arraignment fixed raised the suspicion that there is political undertone. Do you agree? To answer this question, it is perhaps necessary to recapitulate the sequence of events pertaining to this infamous trial. On the 9th of January 2019 the Code of Conduct Bureau received a petition from one Dennis Aghanye. The CCB investigated the petition on the 10th of January 2019 and charged the Chief Justice of Nigeria to the Code of Conduct Tribunal on Friday, the 11th of January 2019 and the case was immediately fixed for the next working day, Monday, the 14th of January 2019. Going by the snail speed at which this government operates, the matter against the honourable Chief Justice of Nigeria has so far been pursued with an uncommon supersonic speed. There is nothing bad about pursuing matters relating to dispensation of justice with dispatch, for that is how it should be but there is everything wrong with sacrificing due process of law on the altar of speed. It is important to point out that the issue here is not whether or not the CJN is guilty of the offence with which he is charged. But the disturbing issue is the lack of due process of law that pervades the entire proceedings from their commencement to their present state. Now the petitioner, Aghanye is the former Publicity Secretary of Congress for Progressive Change (CPC). That was President Buhari's former party. Under the law, the reference from the Code of Conduct Bureau to the Code of Conduct Tribunal is at the instance of the Attorney General of the Federation. The questions that agitate my mind are; why would the federal government engage in this diabolical macabre dance of attempting to remove the Chief Justice of Nigeria from office without complying with due process of law? Why embark on the exercise when the country's general elections are less than six weeks away? Did the architects of this plan consider the effect it would have on the country and the polity? One of my favourite columnists, Olusegun Adeniyi in an article captioned "Jungle Justice for Chief Justice?" in the This Day newspaper of January 17, 2019 captured the mood of the country on the CJN saga when he correctly stated thus: "Just like the Salami saga, the travails of the CJN has divided the nation along partisan lines. With a crucial presidential election less than a month away it is understandable that very few people are prepared to examine this matter dispassionately. But the almighty God according to the late justice Chukwudifu Oputa, 'gave us two ears so that we may hear both sides'. Sadly, it is also clear that because of politics of the moment, those opposed to the continued stay in office of the CJN are not interested in his side of the story. They just want him out despite the fact that the presumption of innocence, a canon of our law is on his side." Again a legal icon and one of the country's constitutional law experts, Prof. Ben Nwabueze (SAN) has rightly in my view, condemned the way and matter the CJN matter has been handled by the Buhari administration. For want of better language, I will prefer to echo him; "The disgrace, degradation and embarrassment caused by the arraignment of the Chief Justice of Nigeria, the head of the third arm of government in the country before the Code of Conduct Tribunal in the way and manner the arraignment was done in this case, is an affront not only on the doctrine of separation of powers, as well as to the office of the CJN and to the whole country." From the circumstances surrounding this matter, I cannot but agree with Prof. Nwabueze. Surely, the CJN matter has been given a heavy load of political colouration by Buhari administration and the country has been the worse for it. Considering the position of the Court of Appeal in the case of Justice Nganjiwa v. F.R.N (2018) 4 NWLR (Pt.1609) 301, almost all the Senior Advocates of Nigeria have argued that even in a case involving the breach of the Code of Conduct, the matter should be taken to the National Judicial Council (NJC) rather than to the CCT. But Prof. Itse Sagay (SAN) argues that no one can get justice against the CJN at the NJC, because he is not only the Chairman of the NJC, he also appoints 20 of the 23 members of the body. What do you think? I respectfully differ from the school of thought that holds the view that given the decision in the case of Justice Nganjiwa v. F.R.N, that cases involving alleged breach of the code of conduct by the CJN should be taken to the National Judicial Council. While cases involving alleged breach of code of conduct by judges should generally be taken to the NJC for consideration, there are specific provisions applicable only to the CJN and other heads of Court in Section 292(1) (a) of the Constitution. As I stated earlier in this interview, Section 292 (1) (a) of the Constitution provides that the Chief Justice of Nigeria, President of the Court of Appeal, Chief Judge of the Federal High Court, Chief Judge of the High Court of the Federal Capital Territory and other heads of Federal Courts can only be removed by the president acting on an address supported by two-thirds majority of the Senate praying that they be so removed for their inability to discharge the functions of their office or appointment (whether arising from the infirmity of mind or of body) or for misconduct "or contravention of the Code of Conduct." Now, when a statute provides that an act should be done in a particular manner, any deviation from the manner provided can only amount to an exercise in futility. I do not agree with Prof. Sagay that no one can get justice against the CJN in the NJC. It is not factually correct that the CJN appoints 20 out of the 23 members of the Council. The next most senior Justice of the Supreme Court who is the Deputy Chairman; the President of the Court of Appeal; the President of the National Industrial Court; the Chief Judge of the Federal High Court; five members of the Nigerian Bar Association (NBA) are members of the Council. Of these, the CJN only appoints one out of the five members of the NBA. Even if the CJN were to be responsible for the appointment of all members of the NJC, that would not make them robots to do his bidding at all times. The CJN would know what to do if an issue he is interested in were to come before the Council. All that needs to be done is for him to recuse himself and allow the Deputy-Chairman to preside. Finally, on this issue, the point must be made that a constitutional provision remains binding on all authorities and citizens of Nigeria. The CJN did not draft the Constitution. He did not grant himself the powers to appoint members of the NJC. If the Executive branch is uncomfortable with these powers conferred on the CJN, they should ignite an amendment of the relevant constitutional provisions. Until that is done they must abide by those provisions and live with them. Having observed the political climate, do you think the major presidential candidates have comprehensive blueprints on how to fix Nigeria in their respective policy documents? Please I retired from politics almost thirty years ago. So I will not permit you to drag me back to politics. We all know what is wrong with Nigeria. So it is not the lack of knowledge of the country's problems that is the issue rather it is not having the correct leadership with the political will to fix them. Nigeria was not designed to work and is never likely to work unless it is politically and economically restructured to function as a modern state. But we keep playing the ostrich -pretending that all is well. Do you think that the Mahmood Yakubu led Independent National Electoral Commission (INEC) in all honesty is prepared to improve on the performance of Prof. Attahiru Jega in 2015? For the sake of our dear country Nigeria, I sincerely wish I could answer this question in the affirmative but the signs I am seeing would not support such an answer. In fairness to the present leadership of INEC, they are logistically speaking, more prepared than the 2015 INEC. But it takes more than logistical plans to successfully conduct an election. The crucial question that you have not asked but which cannot be ignored is; does INEC under Prof Mahmood Yakubu possess the will to resist political pressure to tilt the scale in favour of the ruling party? The empirical evidence on ground considering what happened in the recent governorship elections in Ekiti and Osun States compels me to answer this question in the negative. However, I will be the happiest person if INEC proves me wrong during the 2019 general election. The utterances of some of the INEC national commissioners are not helping matters. One of them, my good friend Festus Okoye recently said that INEC will postpone elections in Rivers State if the court gives a verdict too close to the election. That statement was scandalous to say the least. Some of us do not have short memories. When the Supreme Court eventually resolved the protracted PDP primaries dispute in the last Ondo State governorship election less than three days to the election, INEC bluntly refused to postpone the election despite the PDP's passionate appeal. So what has changed to warrant that policy summersault by INEC as encapsulated in the statement of the said Okoye? It is these types of loose statements that make some of us feel that unless INEC sums up courage to resist political pressures from the ruling party, the prospects for a free, fair, and transparent electoral process are indeed bleak. Corruption is said to be one of the biggest problems of Nigeria. Do you believe that the Federal Government is winning the war against corruption or simply going after perceived opponents? Which war against corruption are we talking about here? Is it being fought in Mars or Jupiter? If it is being fought in Nigeria, I am yet to see it. Is it not a few days ago that the National Chairman of APC, the ruling party, Chief Adams Oshiomhole told members of the opposition that if they joined the ruling party, their sins would be forgiven? That statement was a cruel joke on the so-called war against corruption. Please spare me. There has to first be a war before we know whether it is being won or lost. The Vice-President has stated that the federal government has been accused of pursuing only opposition members but that it has to appear so because they were in power for sixteen years. With the greatest respect to the Vice-President, he missed the point. The accusation really is that; there is a clear absence of political will to go after members of the ruling party and those close to the seat of power when they are accused of corruption. From Abdulrasheed Maina to Kemi Adeosun, from the contract scam in NNPC to the grass cutting Mr. Babachir Lawal, there are numerous examples of uninvestigated allegations of corruption against the president's men. I would not like to go into cases of former members of opposition who were being investigated for corruption but whose investigation were terminated upon crossing over to the ruling party. So my brother, I do not know whether there is a war against corruption. The President for the fourth time declined assent to the bill to amend the Electoral Act, citing closeness to the elections. What do you think of that? It is rather unfortunate that after the bill to ament the Electoral Act had made four missionary journeys from the National Assembly to the president's table, the president vetoed the same. The reason given for the veto exercised by the president is with all due respect, untenable. The proposed amended was to plug the loopholes inherent in the extant rules and regulations governing the electoral process in order to make it difficult for it to be subject to manipulation by those who may want to rig the elections. Sadly, the president refused to sign the bill into law. The amendments were designed to give legal bite to the voting procedure already in place. So closeness to the election could not have been the real reason for the president's refusal to sign the bill. Nigeria was not designed to work and is never likely to work unless it is politically and economically restructured to function as a modern state. But we keep playing the ostrich- pretending that all is well.